Hand-drawn annexation map from Neighborhood Development Services' wall. Annexation was a legal means by which the city of Charlottesville obtained lands in Albemarle County in the 20th century. The process caused much strain in city county relations. In response, Albemarle hired Archibald G. Robertson to serve as is attorney to stave off annexation. Williams said the county needed to protect what consisted of 20 percent of its tax base. City Council held its first reading of the annexation ordinance on January 18, 1960. The resolution cited nine reasons (see below). At a February 2 community meeting on the Beaver Creek Reservoir, five of the six supervisors signed a petition asking that the county get a vote as well on whether to be annexed. Williams, whose own St. Annes Road home was within the area to be taken, did not sign the petition but made his views known. 1. That a large part of the territory proposed to be annexed constitutes a highly urbanized area which according to the constitutional and legislative policy of the State of Virginia should be governed by the municipal government of the City of Charlottesville. 2. The area proposed for annexation together with the present city area constitutes a compact body of land peculiarly adaptable to city growth and government and all of the territory is needed in the reasonably near future for the city's development. 3. For a number of years past there has been a rapid residential and industrial development both within the present city limits and in the territory immediately adjacent o the city limits. As a result an increased number of families require suitable areas for housing development beyond the capacity of vacant lands now within the corporate limits, and the many families now living in apartments or small quarters in residential areas within the present city limits require additional territory within the city limits adaptable to residential purposes and affording desirable locations for home sites. Sufficient land suitable for these purposes and for further industrial and commercial expansion is not now available within the present corporate limits of the City of Charlottesville to accomodate the needs and desires of its present or future population which will be attracted to the city and the adjacent areas in Albemarle County. 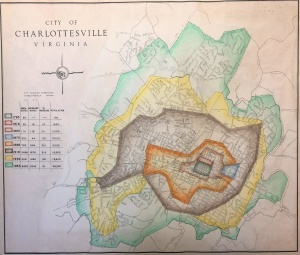 Many former residents and newcomers to the Charlottesville have been compelled to establish their residences beyond the corporate limits because suitable or desirable land was not available in the city. Much of the suburban development and subdivision of property into lots has taken place in the territory which is proposed to be annexed, and which lies just outside the City of Charlottesville in line with its inevitable growth. 4. The creation of attractive, efficient, commercial and industrial districts related to desirable and well protected residential districts can only result from an intelligent zoning policy which is applied to the entire area of urban development. This cohesive development can not be accomplished except under city government of the area since no zoning controls exist in the County of Albemarle. Without such controls, there has been an increasing number of mixed, incompatible land uses in the proposed annexation territory which if continued will work to the great detriment of the city and the residents of the area. This development demonstrates the need for the application of sound planning principles to the land in the proposed annexation area. A single coordinated plan for the division of acquired urban facilities is a requirement for adequate provision initially and efficient operation subsequently. The longer adequate controls are delayed the greater for potential for poorly related or substandard facilities. 5. The people living in the annexation area have their commercial, social, recreational, civic, church and other interests largely within the City of Charlottesville, require daily use of the streets and other public facilities. their interests and welfare are identical with the interests and welfare of the city and are in no way identified with the interest and activity of the county in which they now reside. As a result the annexation area constitutes with the present city, one homogeneous community which can be more completely, efficiently and economically governed, administered and serviced with a fair distribution of costs by being under and being part of the same local government as will be accomplished through the proposed annexation. 6. In much of the territory proposed to be annexed there is no adequate public system for trash and garbage collection and in portions of comparatively dense population, there is also a lack of effect fire and police protection. As a result of this situation it is necessary for the proper protection of the health and safety of those living within the proposed annexation areas that the area be brought under the health rules and sanitary regulations, police and fire protection of the city. 7. A projection of current growth trends indicates that the small available amount of usable vacant lands within the present city limits capable of so being, will be occupied within a few years. It is not practical or possible to develop much of the city's vacant land because it is either not for sale or topographically it does not lend itself to development. 8. The area proposed for annexation from Albemarle County needs for its proper development the administration of municipal government, equipped and designed to meet the needs for an urban population. The urban community included in the annexation area needs a governmental program for protection against the spread of disease, for the education of its children, for police and fire protection with adequate equipment and personnel, modern sewage treatment, further extension of water and sewer lines where practical, parks and playgrounds a recreational program, a central plan of community development, adequate and proper zoning, electrical, building, fire, weights and measures and other inspection facilities, streets, and garbage collection and disposal. Such a program is not feasible unless the area affected is under a single governmental control, of modern design, capable of raising public funds by having sufficient taxable values within its jurisdiction. The accomplishment of such a result requires a consolidation of the annexation area within the city through the present proceeding. 9. 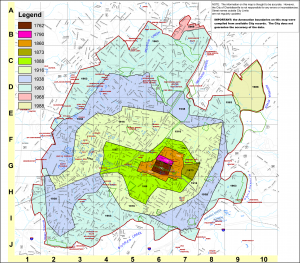 The area of the County of Albemarle is greatly in excess of 60 square miles and the annexation of proposed territory will not materially affect the governmental functions of the county. ↑ Web. In The Circuit Court of the County of Albemarle, To The County of Albemarle, Virginia; The Board of Supervisors of the Said County of Albemarle, Virginia and R.T. W. Duke, Jr, Commonwealth's Attorney of Said County, Staff Reports, Daily Progress Digitized Microfilm, Lindsay family, May 30, 1914, retrieved May 30, 2016 from University of Virginia Library. Print. May 30, 1914 page 2. ↑ Print: Annexation Move Made, Staff reports, Daily Progress, Lindsay family January 5, 1960, Page A1. ↑ Print: County Hires Attorney for Annex Suit, Staff reports, Daily Progress, Lindsay family January 19, 1960, Page 9. ↑ Web. Charlottesville City Council meeting minutes, .pdf, Council Chambers, City of Charlottesville, January 18, 1960. ↑ Print: Council Set To Act on Annexation Bill, Staff Reports, Daily Progress, Lindsay family February 1, 1960, Page . ↑ Print: Annex Law Enacted, Court Action Delayed, Staff Reports, Daily Progress, Lindsay family February 2, 1960, Page 9. ↑ Print: County Petitions Ask Vote On Annex, Staff Reports, Daily Progress, Lindsay family February 3, 1960, Page 13. ↑ Print: Burrows Proposes New Bill for Vote on Annexation, , Daily Progress, Lindsay family February , 1960, Page . ↑ Print: Albemarle To Open U.S. 29 Bus Route, Robert Brickhouse, Daily Progress, Worrell Newspaper group January 30, 1980, Page A3. This page was last edited on 15 January 2019, at 17:54.